مکثایی, ملیحه, شیخ حسینی, عنایت اله. (1396). گندله آهن: یک کاتالیست طبیعی و قابل بازیافت برای تهیه دی هیدروپیریمیدین ها در محیط آبی. نشریه شیمی و مهندسی شیمی ایران, 36(1), 82-93. ملیحه مکثایی; عنایت اله شیخ حسینی. "گندله آهن: یک کاتالیست طبیعی و قابل بازیافت برای تهیه دی هیدروپیریمیدین ها در محیط آبی". نشریه شیمی و مهندسی شیمی ایران, 36, 1, 1396, 82-93. مکثایی, ملیحه, شیخ حسینی, عنایت اله. (1396). 'گندله آهن: یک کاتالیست طبیعی و قابل بازیافت برای تهیه دی هیدروپیریمیدین ها در محیط آبی', نشریه شیمی و مهندسی شیمی ایران, 36(1), pp. 82-93. مکثایی, ملیحه, شیخ حسینی, عنایت اله. گندله آهن: یک کاتالیست طبیعی و قابل بازیافت برای تهیه دی هیدروپیریمیدین ها در محیط آبی. نشریه شیمی و مهندسی شیمی ایران, 1396; 36(1): 82-93. باتوجهبهاهمیتهتروسیکل ­های دی هیدرو پیریمیدین بهعنوان ترکیب ­های فعال زیستی و دارای اثرهای دارویی متنوع در شیمی و بیوشیمی، دراینپژوهش از گندله اهنبهعنوانیککاتالیست طبیعیناهمگنو قابلبازیافتبرایتهیهمشتق ­های 3، 4- دی هیدروپیریمیدینی باواکنشسهجزیی و تک مرحله ای اتیل استو استات، اوره و انواع متفاوتی از آلدهیدهای آروماتیک درحلال آب و اتانول استفاده شد. ازبرتری­ های روشارایهشده می ­توان به بازده خوب فراوردده­ها،ارزان و طبیعی بودن کاتالیست، قابلیتاستفادهدوبارهکاتالیست و روش جداسازی و خالص سازی آسان اشاره کرد. استفاده از آب به عنوان محیط واکنش این فرایند را از نظر اقتصادیبه صرفه و از لحاظ زیست محیطی ارزشمند می­ سازد. Domling A., Recent Developments in Isocyanide Based Multicomponent Reactions in Applied Chemistry. Chem. Rev., 106(1): 17-89 (2006). Ugi I., Domling A., Multicomponent Reactions with Isocyanides. Angew. Chem. Int. Ed., 39(18): 3168-3210 (2000). Ugi I., Werner B., Domling A., The Chemistry of Isocyanides, Their Multi Component Reactions and Their Libraries. Molecules, 8(1): 53-61 (2003). Biginelli P., Ueber Aldehyduramide des Acetessigäthers. Ber. Dtsch. Chem. Ges., 24(1): 1317-1319 (1981). Kolosov M.A., Kulyk O.G., Al-Ogaili M.J.K., Orlov V.D., An Effective Biginelli-Type Synthesis of 1-Methoxy-3,4-dihydropyrimidin-2(1H)-ones. Tetrahedron Lett., 56(32): 4666-4669 (2015). Kappe C.O., Biologically Active Dihydropyrimidones of The Biginelli-Type — A Literature Survey. Eur. J. Med. Chem., 35(12): 1043-1052 (2000). Snider B.B., Shi Z., Biomimetic Synthesis of (.+-. )-Crambines A, B, C1, and C2. Revision of The Structure of Crambines B and C1. J. Org. Chem., 58(15): 3828-3839 (1993). Velpula R., Banothu, J., Gali R., Deshineni R., Bavantula R., 1-Sulfopyridinium Chloride: Green and Expeditious Ionic Liquid for The One-Pot Synthesis of Fused 3,4-Dihydropyrimidin-2(1H)-ones and Thiones Under Solvent-Free Conditions. Chin. Chem. Lett., 26(3): 309-312 (2015). Kappe C.O, Recent Advances in the Biginelli Dihydropyrimidine Synthesis. New Tricks from an Old Dog. Acc. Chem. Res., 33(12): 879-888 (2000). Zorkun I.S., Sarac S., Celebi S., Erol K., Synthesis of 4-Aryl-3,4-dihydropyrimidin-2(1H)-thione Derivatives as Potential Calcium Channel Blockers. Bioorg. Med. Chem. Lett., 14(24): 8582-8589 (2006). Khabazzadeh H., Kermani E.T., Jazinizadeh, T., An Efficient Synthesis of 3,4-Dihydropyrimidin-2(1H)-ones Catalyzed by Molten [Et3NH][HSO4]. Arabian J. Chem., 5(4): 485-488 (2012). Tayebee R., Ghadamgahi, M., Solvent Free One-Pot Multi-Component Synthesis of 3,4-Dihydropyrimidin-2(1H)-ones Catalyzed by Mesoporous NH4H2PO4/MCM-41 As an Environmentally Friendly, Cheap, and Effective Catalyst .Arabian J. Chem., (2013). Tayebee R., Maleki B., Ghadamgahi, M., Ammonium Dihydrogen Phosphate Catalyst for One-Pot Synthesis of 3,4-Dihydropyrimidin-2(1H)-ones. Chin. J. Catal., 33(4): 659–665 (2012). Ghorbani-Choghamarani A., Zamani P., Three Component Reactions: An Efficient and Green Synthesis of 3, 4-Dihydropyrimidin-2-(1H)-ones and Thiones Using Silica Gel-supported L-Pyrrolidine-2-carboxylic Acid-4-hydrogen Sulfate. Chim. Chem. Lett., 24(9): 804-808 (2013). Zare A., Nasouri Z., A Green Approach for The Synthesis of 3,4-Dihydropyrimidin-2-(1H)-ones (and -Thiones) Using N,N-Diethyl-N-sulfoethanaminium Hydrogen Sulfate. J. Mol. Liq., 216: 364-369 (2016). Paraskar A.S., Dewkar G.K., Sudalai A., Cu(OTf)2: A Reusable Catalyst for High-Yield Synthesis of 3,4-Dihydropyrimidin-2(1H)-ones. Tetrahedron Lett., 44(16): 3305-3308 (2003). Salehi H., Guo Q.X., A Facile and Efficient One‐Pot Synthesis of Dihydropyrimidinones Catalyzed by Magnesium Bromide Under Solvent‐Free Conditions. Synth. Commun., 34(1): 171-179 (2004). Mishra B.G., Kumar D., Rao V.S., H3PW12O40 Catalyzed Expeditious Synthesis of 3,4-Dihydropyrimidin-2(1H)-ones Under Solvent-Free Conditions. Catal. Commun., 7(7): 457-459 (2006). Ma Y., Qian C., Wang L., Yang M., Lanthanide Triflate Catalyzed Biginelli Reaction. One-Pot Synthesis of Dihydropyrimidinones Under Solvent-Free Conditions. J. Org. Chem., 65(12): 3864-3868 (2000). Banik B.K., Reddy A.T., Datta A., Mukhopadhyay C., Microwave-Induced Bismuth Nitrate-Catalyzed Synthesis of Dihydropyrimidones via Biginelli Condensation Under Solventless Conditions. Tetrahedron Lett., 48(41): 7392-7394 (2007). Kumar K.A., Kasthuraiah M., Reddy C.S., Reddy C.D., Mn(OAc)3·2H2O-Mediated Three-Component, One-Pot, Condensation Reaction: An Efficient Synthesis of 4-Aryl-substituted 3,4-Dihydropyrimidin-2-ones. Tetrahedron Lett., 42(44): 7873-7875 (2001). Bigdeli M.A., Gholami G., Sheikhhosseini E., P-Dodecylbenzenesulfonic Acid (DBSA), A Brønsted Acid-Surfactant Catalyst for Biginelli Reaction in Water And Under Solvent Free Conditions. Chin. Chem. Lett., 22(8): 903-906 (2011). Xia J., Zhang K., Ga(OTf)3 Catalyzed Synthesis of 3,4-Dihydropyrimidin-2(1H)-ones. Heterocycles, 91(1): 105-112 (2015). Gupta R., Paul S., Gupta R., Covalently Anchored Sulfonic Acid Onto Silica as An Efficient And Recoverable Interphase Catalyst for The Synthesis of 3,4-Dihydropyrimidinones/thiones. J. Mol. Catal. A: Chem., 266(1-2): 50-54 (2007). Saher L., Makhloufi-Chebli M., Dermeche L., Boutemeur-Khedis B., Rabia C., Silva A.M.S., Hamdi M., Keggin and Dawson-Type Polyoxometalates as Efficient Catalysts for The Synthesis of 3,4-Dihydropyrimidinones: Experimental and Theoretical Studies. Tetrahedron Lett., 57(13): 1492-1496 (2016). Eshghi H., Javid A., Khojastehnezhad A., Moeinpour F., Bamoharram F.F., Bakavoli M., Mirzaei M., Preyssler Heteropolyacid Supported on Silica Coated NiFe2O4 Nanoparticles for The Catalytic Synthesis of Bis(dihydropyrimidinone)benzene and 3,4-Dihydropyrimidin-2(1H)-ones. Chin. J. Catal., 36(6): 299-307 (2015). Safari J., Gandomi-Ravandi S., Carbon Nanotubes Supported by Titanium Dioxide Nanoparticles as Recyclable and Green Catalyst for Mild Synthesis of Dihydropyrimidinones/thiones. J. Mol. Struct., 1065-1066: 241-247 (2014). Lal J., Sharmaa M., Guptab S., Parashara P., Sahua P., Agarwal D.D., Hydrotalcite: A Novel and Reusable Solid Catalyst for One-Pot Synthesis of 3,4-Dihydropyrimidinones and Mechanistic Study Under Solvent Free Conditions. J. Mol. Catal. A: Chem., 352: 31-37 (2012). Rajack A., Yuvaraju K., Praveen C., Murthy Y.L.N., A Facile Synthesis of 3,4-Dihydropyrimidinones/thiones and Novel N-Dihydro pyrimidinone-decahydroacridine-1,8-diones Catalyzed by Cellulose Sulfuric Acid. J. Mol. Catal. A: Chem., 370: 197-204 (2013). Moosavifar M., An Appropriate One-Pot Synthesis of Dihydropyrimidinones Catalyzed by Heteropoly acid Supported on Zeolite: An Efficient and Reusable Catalyst for The Biginelli Reaction. Comptes Rendus Chimie, 15(5): 444-447 (2012). Salehi P., Dabiri M., Zolfigol M.A., Bodaghifard M.A., Silica Sulfuric Acid: An Efficient and Reusable Catalyst for The One-Pot Synthesis of 3,4-Dihydropyrimidin-2(1H)-ones. Tetrahedron Lett., 44(14): 2889–2891 (2003). Karthikeyan P., Aswar S.A., Muskawar P.N., Bhagat P.R., Kumar, S.S., Development and Efficient 1-Glycyl-3-methyl Imidazolium Chlorideecopper(II) Complex Catalyzed Highly Enantioselective Synthesis of 3, 4-Dihydropyrimidin-2(1H)-ones. J. Organomet. Chem., 723(1): 154-162 (2013). Silva D.L., Fernandes S.A., Sabino, A.A., Fátima A., p-Sulfonic Acid Calixarenes as Afficient and Reusable Organocatalysts for The Synthesis of 3,4-Dihydropyrimidin-2(1H)-ones/-Thiones. Tetrahedron Lett., 52(48): 6328-6330 (2011). فیروزی، م؛ بقالها، م.؛ اسدی، م.؛ سنتز زئولیت ZSM-5 به عنوان کاتالیست فرایند تبدیل متانول به پروپیلن، نشریه شیمی و مهندسی شیمی ایران، (2)31: 21 تا 26 (1391). Sheikhhosseini E., Mokhtari T.S., Faryabi M., Rafiepour A., Soltaninejad S., Iron Ore Pellet, A Natural and Reusable Catalyst for Synthesis of Pyrano[2,3-d]pyrimidine and Dihydropyrano[c]chromene Derivatives in Aqueous Media, Iranian J. Chem. Chem. Eng., 35(1): 43-50 (2016). Sheikhhosseini E., Mollaie M., One-Pot Synthesis of Tetrahydrobenzo[b]pyran Derivatives Using Iron Ore Pellet as Natural, Efficient and Reusable Heterogeneous Catalyst in Aqueous Media. 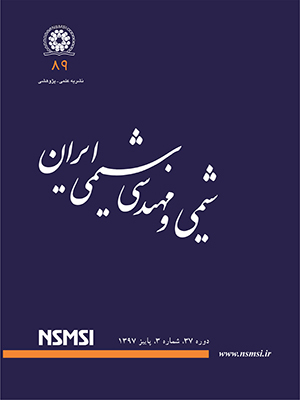 Iranian Journal of Organic Chemistry, 6(4): 1337-1377 (2014).